in Video No. 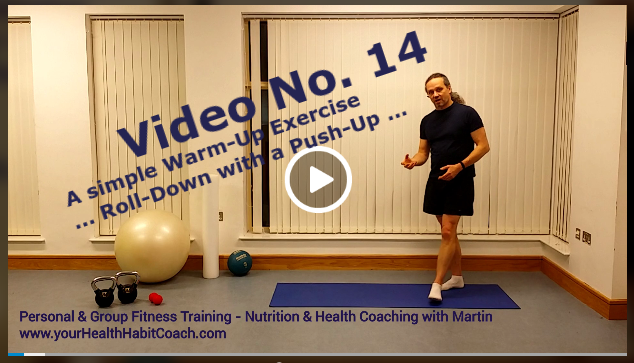 14 you are going to learn a very simple, yet effictive “Warm-Up Exercise”. It’s easy to do and I will show you a few different variations in the video (from Beginners to Intermediate Level). The “Roll-Down with a Push-Up” combines back / spine mobilization and looseing with a upper-body warm-up (shoulders, chest and arms) plus adds a stretch for your hamstrings and calves (back of your legs) as well. You don’t even need a mat, just a bit of space. This exercise can simply be added to other warm-up exercises like neck, back, shoulder and spine mobillization moves, a bit of foam-rollering, some dynamic stretching etc.. Always do a 8-10 mintue warm-up routine, as this prepares the body for your main workout and aim to make the warm-up exercises specific to the exercises you plan to do. Enjoy, let me know how you get on and send me an e-mail with questions you have in relation to this exercise. This entry was posted in Core Strength Videos, Fitness Exercise Videos, in South Dublin and tagged in Dundrum, in Leopardstown, in Sandyord, in South Dublin, Press Up variations, Push Up variations, Sandyford Community Centre, Taney Parish Centre, Warm up, Warm up exercises, with Martin, with Martin Luschin on December 4, 2016 by admini.